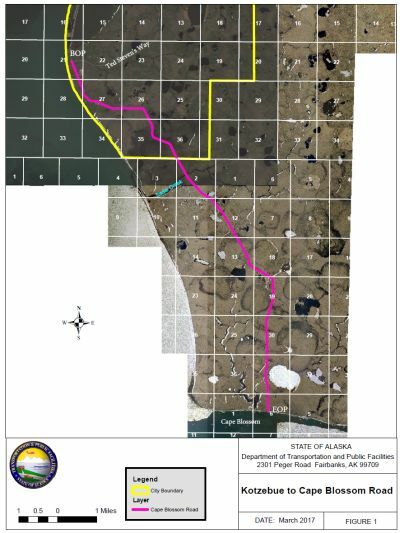 The Alaska Department of Transportation and Public Facilities (DOT&PF) has completed an Environmental Assessment (EA) in support of a proposed road from Kotzebue to Cape Blossom on the Baldwin Peninsula. The road would improve access and enhance safety between Kotzebue and the shoreline on the southwest side of the Baldwin Peninsula. The project is funded by the Federal Highway Administration (FHWA) and fully complies with the National Environmental Policy Act (NEPA) and other federal, state, and local regulations. The proposed Cape Blossom Road project will include constructing upgrades to existing Air Force Road south of the Hillside Road intersection to the Kotzebue Electric Association (KEA) Wind Farm; and constructing a new two-lane, gravel road from the wind farm south, including a crossing at Sadie Creek, to a beach access ramp above the high tide line at Cape Blossom. 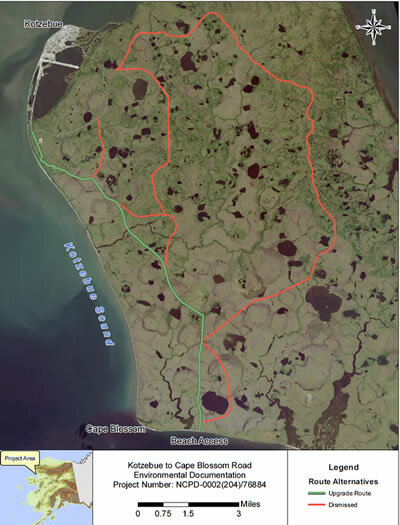 The proposed road would provide for all-season access between Kotzebue and Cape Blossom. Environmental: The project has completed the required environmental documentation under the National Environmental Policy Act (NEPA). The initial EA and Finding of No Significant Impact (FONSI), as well as a 2017 EA Re-Evaluation outlining several minor design revisions, are available on the project documents page. The next steps are to complete acquire all project permits, acquire necessary Right of Way (ROW), and complete the final plans and specifications for construction. Additional ROW discussions are ongoing with other landowners including Kikitagruk Inupiat Corporation (KIC), the NANA Regional Corporation (NANA), and the U.S. Department of the Interior, Bureau of Land Management (BLM). Once ROW is acquired and all permits have been received, DOT&PF intends to advertise this project for construction. See the Project Schedule for more detail. Construction of the Cape Blossom Road would be phased to complete construction as additional funding becomes available.